For more information, eligibility, and application information, click here. The University of Maryland/Sheppard Pratt psychiatry residency training program is designed to prepare our graduates to succeed in whichever field of psychiatry they choose to pursue; many graduates go on to become academic clinical educators, subspecialists, full-time research psychiatrists, community psychiatrists, private practitioners, and psychoanalysts/psychotherapists. We offer training in a wide variety of settings, including a VA hospital, state psychiatric hospital, and a private, non-profit psychiatric hospital that is home to some of the most specialized programs in the nation. 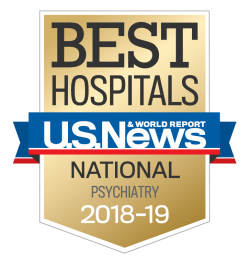 Our program provides comprehensive, in-depth training in all aspects of psychiatry in a collaborative, collegial, and supportive environment, and is enhanced by intensive supervision, a comprehensive didactic curriculum, and case conferences. Residents work in four core clinical facilities during the four-year program: the University of Maryland Medical Center, the Veterans Administration Maryland Health Care System, the State Mental Hygiene Administration System, and Sheppard Pratt Health System. The Sheppard Pratt Health System is the largest private, non-profit provider of mental health, substance use, special education, developmental disability, and social services in the nation. There are many benefits to completing your residency training at the University of Maryland/Sheppard Pratt psychiatry residency training program. Click here to learn more. Click here to learn more about program eligibility and the application process.